After a run of blog posts that trended toward the darker feel of things it seems like the right time to share some positives of reducing wasted food. While the topic of wasted food itself can be disheartening, this perspective need not dominate our thinking and feelings. Yes, it is a big problem that needs some serious attention, but with an optimistic approach, each one of us can start small and make a difference; it doesn’t have to feel like drudgery. This is one of my favorite quotes about maintaining a positive attitude and shifting your perspective: “It is our attitude at the beginning of a difficult task which, more than anything else, will affect It’s successful outcome.” – William James. Honestly, my attitude about leftovers and what to do with them, especially as the third straight day of chili rolled around, hasn’t always been positive. I imagine those stuck in a room with me during this leftover stretch felt the same–hehe. At this year’s Farm-2-Table Trade Meeting, one of the chefs presenting at our Toward Zero Waste workshop remarked, “I like to cook with what is available. Working with what is on hand and what is in season is what feeds my creativity and that is how I create my menu. Cooking the same thing day in day out just doesn’t have the same appeal.” I have also been inspired recently by Tiffany Bell of Ten Fold Farms and my awesome co-worker, Abbie Lindeberg, for their passion for creative leftover ideas. Last night we were on a leftover roll, literally. We had some really delicious flank steak left over from the weekend we turned into scrumptious French dips. But as happenstance would have it, all three of my kids had to dash out to soccer, and there was a good portion of tater tots left unconsumed. I’ve eaten the tater tots the next day…but they are just so soggy and really quite unappetizing, and I wasn’t looking forward to doing it again. Then I had that Aha! moment, motivated by thoughts of “What would Tiffany and Abbie do?” Today those tater tots that otherwise would have fallen into the ‘soggy/have to eat it before they spoil’ category, were all scrambled up with my breakfast eggs. A few fresh tomatoes and chives from my garden on top, and those tots took on a whole new look, and breakfast tasted great! 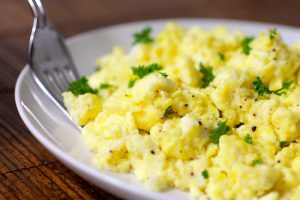 So, next time you have some tots left over, skip the soggy, and instead give them a rough chop and add them to your scrambled eggs. Here is another option courtesy of Abbie! Throw everything that is lonely or a little wilted in a big pot of soup. Start with soup stock (I make mine from chicken bones and veggie scra ps such as onion peels). Then just start adding those items that need to be used. The last few bites of pasta? Throw it in. Leftover carrot sticks from your kiddo’s lunch? In the soup they go. The last scrapings of a dressing bottle, hummus container, or other condiments? Pour a little water in the container, shake it up, and use that liquid to season the broth. Wilted broccoli stems? Soup it! A chicken penne recipe gone wrong? Add it on in! 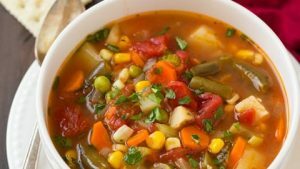 Once you’ve got your pot of refrigerator soup, give it a taste and add some seasonings to pull it together. When in doubt, a little salt, pepper, and tang such as lemon juice or pickle juice really help to tie things together. The same theory can be applied to taco fillings! So, how about going for it and getting all scrambled and souped up–because reducing wasted food can be a fun, creative, and delicious endeavor. A shift in perspective and attitude will make a difference–for our earth and your food budget!